This Saturday, the year 10 class will be learning their attached pronouns and demonstrative pronouns. We will also be reviewing the detached pronouns. This is an activity sheet for them to complete. It helps for them to see that they are using their knowledge of Arabic keywords to slowly translate English sentences.If they understand that they are capable of doing that – insha Allah unconsciously, they will look at new surahs and feel confident enough to translate from the Arabic text itself – by themselves. So here is the free pdf for the demonstrative pronoun worksheet. I hope you find this useful insha Allah! 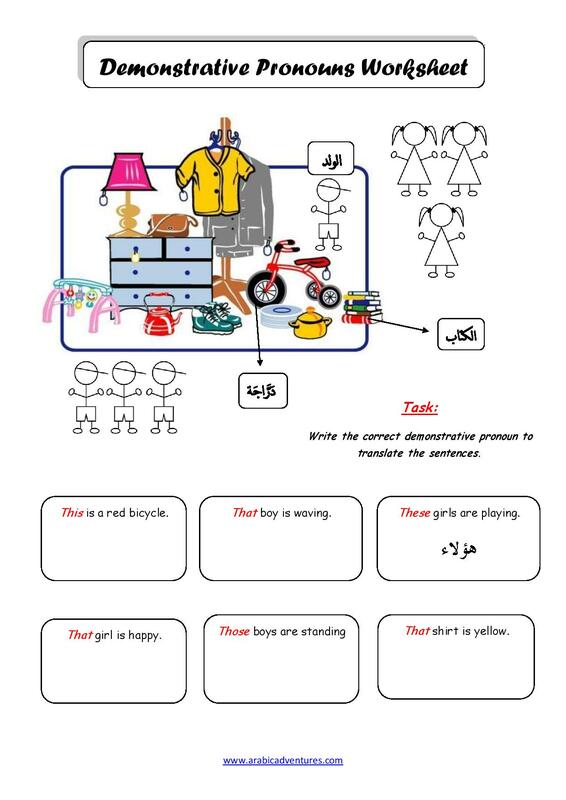 This entry was posted in Arabic Grammar, Arabic worksheets and tagged activity, arabic, arabic demonstrative pronouns, arabic grammar, arabic grammar review, arabic printables, arabic pronouns, arabic worksheet, assessment, attahed pronouns arabic, classroom, detached pronouns arabic, Juz Amma, Juz Amma resources, Qur'anic Arabic, Quran curriculum, quran syllabus. Bookmark the permalink.